For any reviewer, the first step to objectivity is paying out of one’s own pocket for the concert ticket. The next is to go for said concert out of one’s free will. Both these conditions were satisfied when I attended Rejoice! 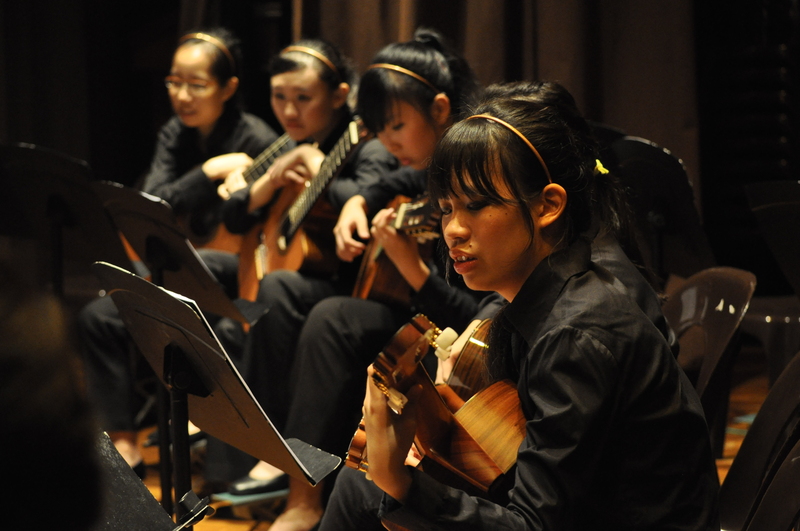 A Celebration of Music – performed by the Y1-4 and Y5-6 Guitar Ensembles – on the 31st of May. Now if you expected that to be a handle for a horrendous review to come, be mistaken – it was a night of good music played in a relaxed atmosphere that certainly lived up to its tagline. Even those attendees strong-armed into coming by their friends were visibly enamoured by the tunes. To be honest, first impressions left me slightly disappointed. Instead of guiding guests into the RI Auditorium, the ushers were busy exploiting the modicum of free time posing for photos. Perhaps that explains why people were still shuffling in until the concert commenced at 7.45, that is 15 minutes late. To make matters worse, the emcees (more about them later) started the show in an awkward manner and the lights crew seemed unable to decide if they wanted the hall illuminated or not. Thankfully, my doubts about the concert’s quality were cleared with the opening song, Handel’s La Rejouissance, played strongly and expertly by RJGE’s Year 6 batch. The Year 6s were soon joined by the rest of the ensemble who then performed Slavonic Dance No. 8 and Mountains in Autumn in a rousing display that held the audience’s rapt attention throughout. That the guitar could be used as a percussion instrument at opportune moments surprised many in the audience. Most impressive, was that the guitar’s full range was utilised to produce a harmonious, full bodied sound, debunking the myth that the performance would be monotonous if not boring. 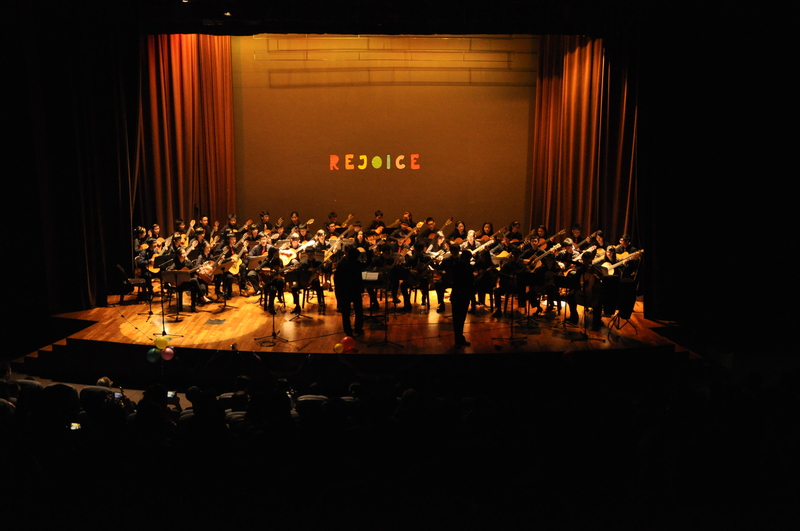 …like Soul le Ciel de Paris, played by the Year 5 batch, where it was evident that the guitar could not replicate the smooth melody as sung by an accomplished French vocalist. On the other hand, the following classics I Will by the Beatles and Right Here Waiting by Richard Marx were brilliantly executed, as was Aquellos Ojos Verdes, a Spanish song performed by the Y1-4 Ensemble. Never failing to surprise, RJGE’s EXCO then performed a pre-intermission medley of cartoon theme songs decked out in colourful dresses, a clear contrast from the all-black uniform of the full Ensemble. The small group performances continued after the break, with RIGE’s EXCO playing Brazillian Streetdance. RJGE continued their fashion show with hip clothing to a medley of Jay Chou songs and more elegant wear while playing a medley of movie soundtracks. The vocal accompaniment to many of the songs added to the feel-good lounge mood of the concert. Before the Ensembles could come together for a final song together, there was much confusion in an act whereby the conductor Mr Gaspar was ostensibly kidnapped and an actor took his place in an attempt to conduct the ensemble to little success. While this reviewer is cognizant of the Ensemble’s desire to show some appreciation to their hardworking conductor, the self-indulgence in this effort lacks true meaning insofar as it alienates the audience, leaving many bewildered. This theme of self-indulgence is recurrent throughout the concert. For example, the emcees fall over laughing at their own jokes, most of which were inappropriate to the occasion. The vocalist during the encore performance, who was pretty good by the way, was a character entirely foreign to this reviewer as well as the person sitting beside him. But these are minor problems – as a concert billed as a celebration of music and with only a month after the SYF to prepare and rehearse, I would call it an excellent performance. They say that ‘music calms the savage breast’, a claim that in most contexts would seem like utter rubbish. Not here though. RI and RJ Guitar Ensemble’s combined concert brings out the unique character of each Ensemble, showing that beyond the gaffes and lame puns, Guitar Ensemble is brilliant at what they’re supposed to be good at – bringing great music to our ears. The Year 1s didn’t perform in the “year 1 & 2 ensemble” only the year 2s did. And their conductor was Mr Francis, not Mr Michael Gaspar. Also, Allegro and Rainbow Overture were our 2 SYF pieces, so that’s probably why they were professional. Just pointing out a couple of mistakes, Y1&2 ensemble was conducted by Mr Francis Sta Maria. RIGE EXCO did not play Rumba, but Brazillian Streetdance. 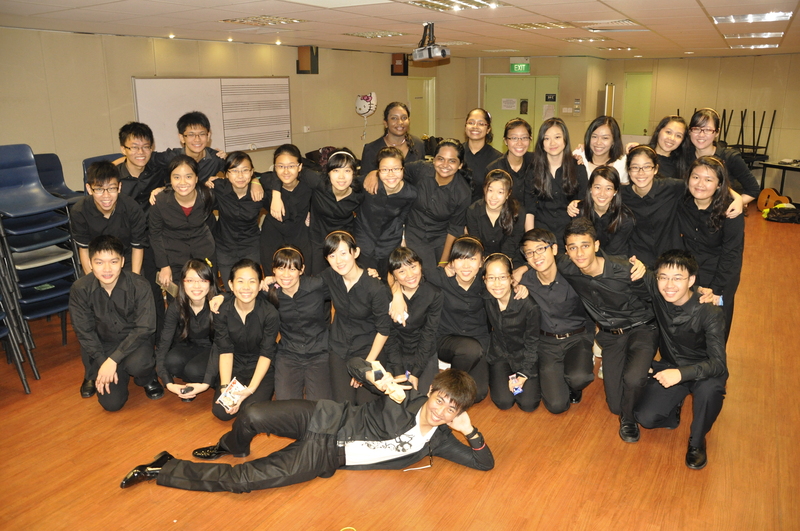 There were no drums during EXCO piece as well. The singer for the encore piece was conductor Mr Francis Sta Maria, which makes me wonder why you do not know who he is, despite having seen him conduct the Y1&2 ensemble pieces. Of course, some parts like the self indulgence feel are true. And sure, the emcees weren’t great, but kudos to them for putting in the effort. Anyways thanks for coming down for the concert, glad you enjoyed yourself. Those are just some pointers for your review. Remember to credit the right people, and note the correct songs and instruments played. Overall quite a fair review! Thanks for the corrections, I think its nice that Raffles Press bothers to put in effort to make the changes :) and yeah I think emceeing concerts like these certainly wasn’t an easy task, thanks a lot to the emcees (and crew) for helping out.